Birna was a beautiful 2nd prize grey mare. 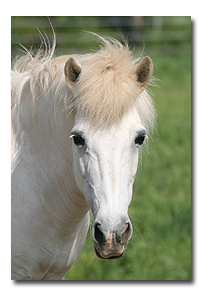 What was most unique about her is that she was an almost purely line bred horse from the famous Kolkuós line. 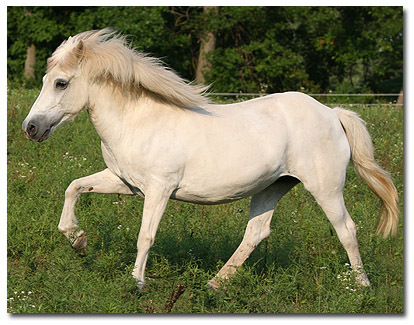 Unlike most Icelandic horses today which are of mixed breeding, Birna was from an almost completely pure line. As such she had tremendous genetic breeding strength. The Kolkuós horses are well known for their elegance in conformation and movement and high intelligence - and Birna was no exception. 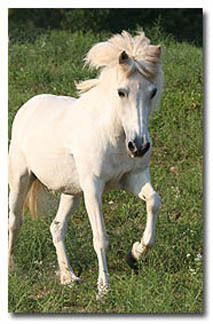 Birna’s sire was the famous first prize stallion Feykir frá Hafsteinsstöðum. Feykir is now deceased but he has left his mark on Icelandic horse breeding producing many exceptional breeding, competition, and pleasure horses. Birna’s dam, Hvöt frá Kolkuósi was a daughter of Hörður frá Kolkuósi - the famous foundation stallion of the Kolkuós line. Birna was a good sized mare measuring around 13.3. Her movements were large and supple and she showed quite a bit of tolt at liberty in the field. Even when she reached an advanced age she showed little signs of stiffness. Her character was always very self confident and calm. She had a strong sense of self and was extremely polite and respectful. She was the matriarch of our herd. Birna passed away in the Spring of 2009. However, she lives on through her talented son, Blær from Sand Meadow, who is a successful breeding stallion in Canada, evaluated first prize for conformation, and second prize overall. It was our true pleasure to have given this grand mare a home in her golden years. We miss her presence at Sand Meadow.